There is nothing I like better than biting into a warm cookie on a chilly winter day. Even better if that cookie happens to be full of cinnamon and nutmeg. Those scents fill the house so perfectly, just like a fuzzy warm blanket. I can see why they're so often used during open houses, they instantly create that feeling of home. 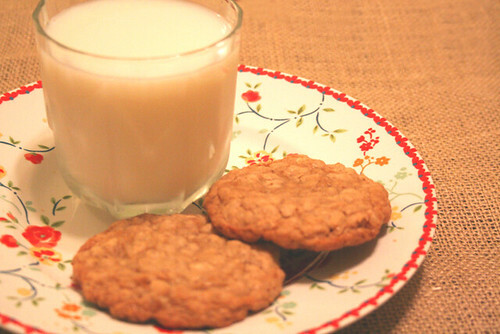 I've been searching for a good oatmeal cookie recipe for ages and I think I've found the one. This has been one quest where I've been more than a little picky. My treasured favorite from childhood had lost their luster as I noted that the last time I made them that I've developed a distaste for the flavor of shortening. Raisins are out as well, especially if I want my family to enjoy them. These were perfect, nice and crisp with a warm and comforting flavor. The recipe I used is from the Williams-Sonoma Cookies book if you're curious to give these a try yourself. For a similar recipe online, this one is close (substituting the raisins for chopped walnuts). Other things I'm excited about? These plates! Mom and I have been on the hunt for a new set of plates for almost a year. Nothing was quite right. I was inspired by a set that I saw in the Farm Chicks cookbook, but thought something similar would be impossible to find. A trip to Home Goods on a completely unrelated note proved me wrong. I am smitten.